"This is a classic Swedish recipe, beloved by every Swede. It is one of the first things children learn to make, and it's enjoyed greatly by all ages. The balls can either be bite-sized or giant, whichever seems more appealing. Or make one big ball, and many small ones. Additional cocoa powder or chocolate can be added to intensify the flavor." Mix the oats, sugar, and cocoa together in a bowl. Add the butter, and use your hands to mix the ingredients together to make a thick dough. Mix in the coffee, vanilla, and chocolate until thoroughly blended. Place the coconut flakes in a small bowl. Pinch off small amounts of dough and roll between your hands to make small balls, about 1-1/2 inches in diameter. 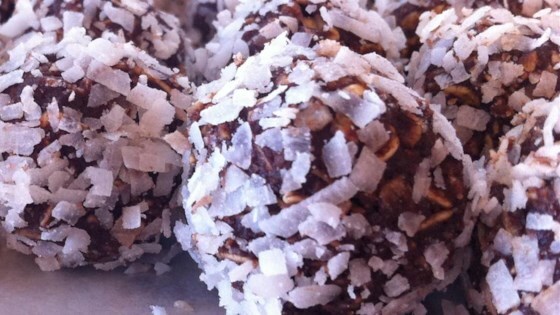 Roll the balls in the coconut flakes. Balls are ready to eat, or may be refrigerated 2 hours to become firmer. A great on-the-go breakfast or snack time pick-me-up! These chocolate balls are also often flavored with Swedish 'Punsch' liqueur or arrak extract, which gives them their name as 'Arrak Balls.' They can also be rolled in chocolate sprinkles or chopped toasted almonds. Place the balls in small paper candy cups for serving at holiday parties. Not one person in my family liked them. Very disappointing. Two stars for no bake. My husband, who is from Sweden, loved these chocolate balls. He said it reminded him of home and was so excited when he tried them because they tasted exactly how he remembered them. These are a joy for your taste buds! I mix the coconut in with the batter.